Through the introduction of football performance analysis, football games has been analysed in many ways. 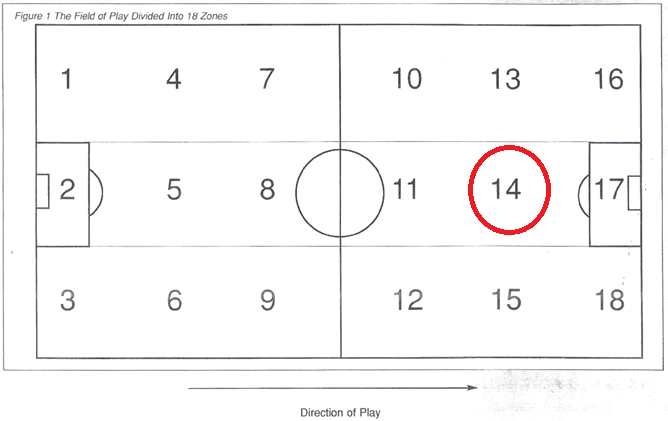 Zone 14 was classified as the “golden square” in the pitch which helps teams score more goals. It was supported by evidences showing that successful teams had a better performance in zone 14. In this post, the two examples used would be France (1998-2000) and Manchester United (1998-1999). By dividing the field into a six-by-three grid, there are 18 zones on the pitch. Zone 14 is the zone located in the middle of the pitch immediately outside the penalty area appears crucial for goal scoring (Taylor et al., 2002). It is shown in the following diagram. Why is Zone 14 so important? It is one of the key factors to differentiate the successful and unsuccessful teams (Grant et al., 1998). Other researchers had the same result showing that successful teams attack through the centre of the field more effectively than less successful teams (Grant, 2000; Horn and Williams, 2002). The first example is France national team (1998-2000). In July 2000, France became the first nation to win the European Championship (2000) as World Champions (1998). It was found that 81.3% of their assists in two competitions came from the central area (Horn et al., 2000). In other words, France’s attacking play was narrow. Another finding showed that the majority of France’s attempt at goal came from assists in central attacking area just outside the penalty area (Horn et al., 2000). The second example is Manchester United FC (1998-99), which was the first English side to win Premiership, F.A. Cup and European Champions League in the same season. Grant and Williams (1999) did a research on this team and found that passing was the most common form of assist. Moreover, the majority of passing assists came from central attacking area. The above findings gave a brief idea what zone 14 is. Different researches have their own view but generally their opinions were very similar. Grant et al. (1998) argued that Zone 14 is the attacking midfielder area which is the crucial area for producing successful attack. Horn et al. (2000) and Taylor et al. (2002) both argued that Zone 14 is the key area which produces vast majority of passing assist. Grant and Williams (1999) did not mention zone 14 but they found that passing is the most common form of assist and the majority of passing assists came from central attacking area. In fact, some coaches know the importance of this zone but they refer it by using another name “The Hole”. However, from the perspective of performance analysis, the researchers had brought forward the understanding of how it works (Telegraph, 2002), which is shown in the following paragraph. How to use Zone 14 effectively? Effective use of Zone 14 must be combined with positive, forward passing and tight possession from the back of the field (Telegraph, 2002). The keywords are “positive, forward passing” which lead to the next question “where the ball should be passed?” According to the Horn et al. (2002), teams were more than 4 times more likely to score goals by playing directly into the penalty area than playing laterally to the wings. In other words, fewer goals would be scored through possession leaving zone 14 to the wide areas. Possession time is another reason why the ball leaving zone 14 should be passed into the penalty area directly. Horn et al. (2002) found that the ball was kept in zone 14 for 2.7 seconds in average in order to score a goal. If the possession lasts over 8 seconds, then it won’t produce an attempt on goal. That means quick attack is a key point in using zone 14. No doubt, moving the ball laterally rather than forward into the penalty area is likely to introduce more passes and longer time in possession, then the threat of zone 14 would be neutralised. Who is Zone 14 for? The zone 14 is effective only when exploited by a skilful player who can quickly change the direction of attack with a short pass or twisting run lasting no more than 8 seconds (Horn et al., 2002). Therefore, the players with the ability to play in zone 14 are highly technical. They should be the players that were regarded as the most exciting to watch. Grant et al. 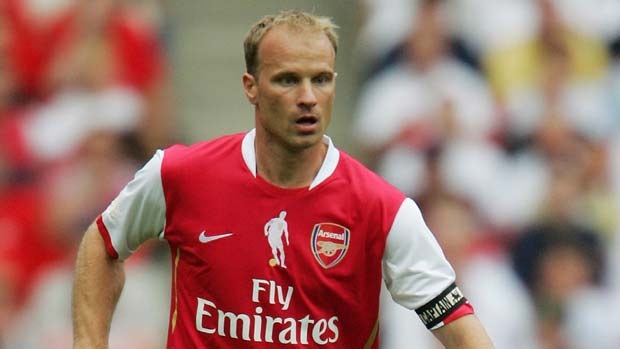 (1998) mentioned Zidane and Bergkamp as examples. Although Zone 14 is so important in attacking, it doesn’t mean that teams should not make crossing from both flanks. Crossing is a very effective way to produce goals also. In fact, Grant (2000) found that successful teams are effective at using crosses to score goals. The key point is that teams should avoid using zone 14 to attack wide areas, which is proved in previous findings. Instead of using short wide passes from zone 14, teams should switch the ball across the whole field, or move the ball forward all the way down one side to attack flanks and make crossing (Horn et al., 2002). 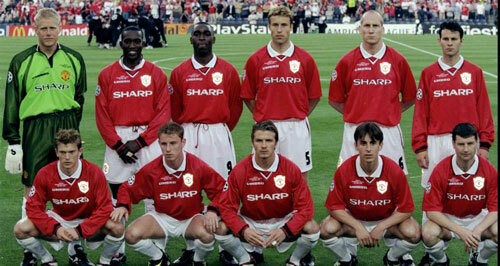 In the example of Manchester United (1998-99), it was found that the team was able to make flank attack and have the ability to penetrate through central attacking area (Grant and Williams, 1999). In the France team (1998-2000), their attacking play was very narrow so there were not many crossing assists. Zone 14 is located outside the penalty area. It is a factor to differentiate successful and unsuccessful teams because it provides most assist. The most effective way to use zone 14 is to make a forward passing into the penalty area. Moreover, the attacking play should be quick. The possession in zone 14 should not be more than 8 seconds. The importance of flanks attack should not be ignored because a successful team should be able to make both attacking styles. In my opinion, the best way is to attack through zone 14 first as it is more effective. If they can’t penetrate through the central attacking area, then they attack the wide areas. Posted on 19/08/2013, in Football and Science and tagged Bergkamp, France, Manchester United, Zidane, Zone 14. Bookmark the permalink. 7 Comments. Спасибо за обмен своими мыслями о% meta_keyword%.